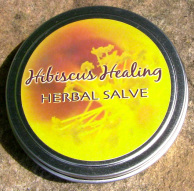 This salve is perfect for wounds that need plenty of lubrication so a bandage won't stick to it. It's also great for cuts that don't require a bandage. It's extremely effective in healing burns. Keep the burn coated in salve until it heals. It is also helpful for healing bruises because of the arnica and comfrey oils. You can even use this salve on extra-dry skin or irritated skin with rashes. 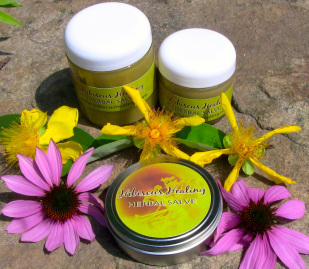 Check out my blog post on the top benefits of herbal salve's amazing healing qualities and even learn to make your own. Echinacea, Arnica Flower, Calendula Flower, Jackass Bitters, Plantain, Chamomile Flower, St. John’s Wort whole plant, and Comfrey Leaf in a base of Organic Non-GMO Canola Oil.